Cars and pedestrians are too often a dangerous combination. 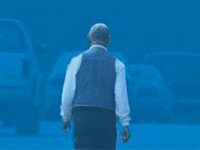 Streets engineered for speeding traffic — with little or no recognition for people on foot, in wheelchairs or on bicycles — are "dangerous by design," explains the National Complete Streets Coalition in the 2016 Dangerous by Design report, of which AARP is a sponsor. The data compiled covers the years 2005 to 2014, a decade during which 46,149 people were struck and killed by cars while walking. "We must use every tool available to improve safety for pedestrians," declare the authors. "Ending drunk or distracted driving, enforcing speed limits, and reminding pedestrians to cross streets safely are all important parts of this effort. So is better, safer street design. "Streets without sidewalks or pedestrian crossings, with wide lanes that encourage people to drive fast are simply designed to be dangerous for people walking. People walk along dangerous roads despite the clear safety risk. This is not user error. Rather, it is a sign that these streets are failing to serve the needs of everyone in a community." As with the prior Dangerous by Design reports, which were published in 2012 and 2014, the current release includes a Pedestrian Danger Index (PDI) ranking of every state and the nation's 104 largest metro areas. A PDI rank number is a calculation of the share of local commuters who walk to work and the most recent data on pedestrian deaths. According to the index, nine of the 11 most dangerous metro areas for walking in the United States are located in Florida. This isn't a surprise, since, say the authors, "Florida has been the most dangerous state for walking since we first began tracking these numbers in 2009." 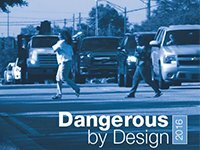 According to the 2016 Dangerous by Design report, when looking at all pedestrian deaths, Florida ranks #1 in the nation. "Florida's improved safety efforts are reflected by its statewide PDI, which, though still the worst in the nation, has declined by 5.8 points since 2011." "Every road planning and design project can and should consider the safety of people who are walking. Do engineers need to build every street as a pedestrian boulevard? No. Should they at least consider whether people will walk along every street they build? Yes." To date, more than 1,000 communities in the United States have adopted Complete Streets policies. (The complete list, and examples of the policies, can be found on the National Complete Streets Coalition website.) Several cities are setting Vision Zero goals, which means the municipality is seeking to have streets so safe that there are "zero" traffic fatalities or severe injuries. Based on medical evidence that moderate physical exercise significantly cuts the chances of diabetes, dementia, depression, colon cancer, cardiovascular disease, anxiety and high blood pressure, in the fall of 2015, U.S. Surgeon General Vivek H. Murthy issued a "call to action" promoting the benefits of, and need for, Americans to walk more. "Walking is a simple, effective and affordable way to build physical activity into our lives," Murthy says. "That is why we need to step it up as a country ensuring that everyone can choose to walk in their own communities." However, in too many communities, the Surgeon General's encouragement that people "Step It Up!" can be, notes the Dangerous by Design report, "a dangerous or potentially deadly prescription." Some populations are especially at risk. To quote the report: "At 20 mph, the risk of death to a person on foot struck by a vehicle is 6 percent. At 30 mph, that risk of death is three times greater. And at 45 mph, the risk of death is 65 percent — 11 times greater than at 20 mph. When struck by a car going 50 mph, pedestrian fatality rates are 75 percent and injury rates are more than 90 percent." "People walk along these roads despite the clear safety risks — a sign that these streets are not designed to serve everyone in the community." A recommendation is also offered for what "Every American" can do. But the solution, say the authors, needs to be led by those with the authority and skills to implement change. "Everyone involved in the street design process — from federal policymakers to local elected leaders to transportation engineers — must take action to end the alarming trend of pedestrian deaths. So long as streets are built to prioritize high speeds at the cost of pedestrian safety, this will remain a problem. And as the nation's population grows older on the whole, and as we become more diverse both racially and economically, the need for these safety improvements will only become more dire in years to come." — Melissa Stanton is the editor of AARP.org/livable. From the award-winning slideshow, "Dangerously Incomplete Streets"